Which Channels Do Consumers Prefer When Communicating With Brands? | ASTRALCOM - Content Strategy, Conversion Marketing and Customer Acquisition. 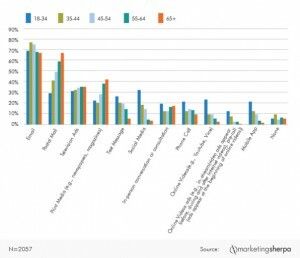 Which Channels Do Consumers Prefer When Communicating With Brands? MarketingSherpa issued this awesome article about how customers prefer to communicate with companies and you might be surprised by the findings. When it comes to email, everyone – all ages – prefer this method of communication, over all others. 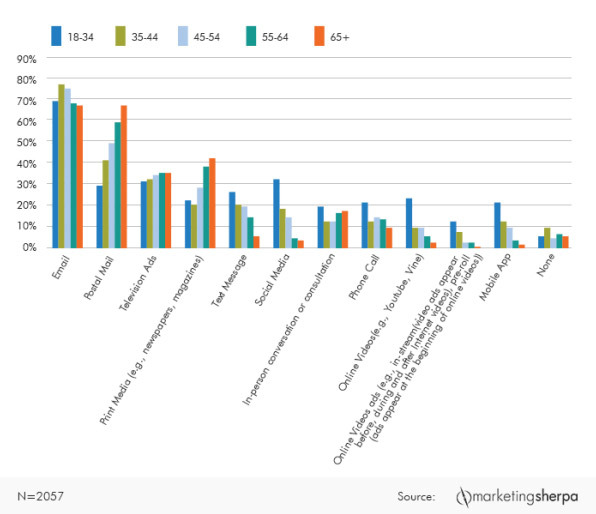 MarketingSherpa notes that these findings fly in the face of conventional wisdom; which says that these age groups all favor these communication aspects in widely varying ways. So, knowing that everyone prefers this method of communicating with brands, how effective are your email campaigns? You can read about how print and postal channels are both still declining and get more details on the age groups and findings in MarketingSherpa’s article at this link. The importance of including email in your channel mix cannot be overstated. You’d be surprised at how many brands treat email as an afterthought. Contact ASTRALCOM and we will help you plan, implement and measure a killer email campaign. When Does the Buyer Journey Start? When Does it End? Will Google’s Redesigned SERP Layout Increase Competition for Fewer Ad Positions?